group of people using the additional supplied microphone. A built in microphone within the unit picks up the sound of the person talking and transmits it to a small magnetic field generated by the loop (approx 1 metre). This is then picked up by the hearing aid. The unit is powered by a built in rechargeable battery and can also be used with mains electricity. 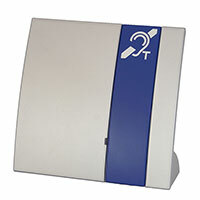 Being portable, the unit offers flexibility for many situations and will help your business or organisation meet the requirements of the Equality Act 2010 in meeting the needs of those with hearing impairment. We don’t however just leave you with a portable loop and leave you to get on with it. We provide training for your staff/users so that everyone is aware of how hearing impairment affects people, how hearing aids work and how the portable loop system can be used by your organisation most effectively. We also provide a 2 year guarantee and the option of service contract at the end of the warranty period.